It seems we are hearing about hidden toxins in practically everything these days from the air we breathe to the water we drink to the food we eat to the cleaning products we use. But skin care products? 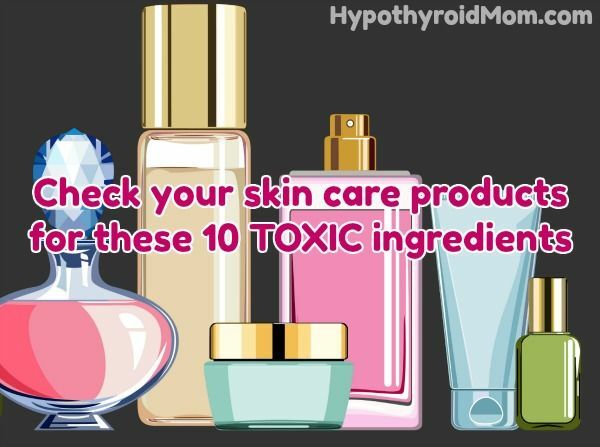 Yup, even the creams, lotions, perfumes, and makeup we apply directly on our skin (our skin is the largest organ in the body and its pores absorb much of what we put on it) are often filled with harmful toxins. Grab all your skin care and beauty products together right now. Turn every single bottle over and read the list of ingredients. Let me guess. Each label has an unbelievably long list of ingredients that are hard to pronounce and sound like they were created in a lab. Right? You’ve probably heard about all the hidden chemicals and health risks surrounding so many of the beauty and skin care products on the market, but what exactly are they and will you ever be able to put on your lotion or eye cream again in peace — without wondering if you’re poisoning your body? To help you in this mission to makeover your personal stock of cosmetics, we’ve put together a list of the top 10 ingredients you should avoid in anything you buy, but the list of toxic ingredients unfortunately keeps growing. By steering clear of these nasties, you can rest assured that whatever you’re putting on your skin isn’t harming it. Parabens are unquestionably the most commonly used preservatives in the cosmetics industry. They’re in just about any cream you might use, as they prevent mold, fungus and parasites from sprouting and growing in your products. While these preservatives may keep products from “spoiling” quickly, they also have a few dangerous qualities that concern me. According to research conducted at Cornell University, parabens mimic estrogen, which can cause an increase in the incidence of breast cancer. In fact, a 2004 study found that 19 out of 20 patients who were tested had some type of paraben in their breast cancer tissues. There is a growing concern that excessive use of parabens may give rise to breast cancer in women and testicular cancer in men. Although there haven’t been any conclusive studies proving this, it should be enough to make you concerned. In fact, it’s why there are so many “paraben-free” items popping up in the supermarket and pharmacies around the country. Another fact that I found very interesting is that parabens can be absorbed through the skin of pregnant women and disrupt the development of a fetus during pregnancy- particularly when it comes to the future fertility of male fetuses. This is supported by a study completed by the Tokyo Metropolitan Research Laboratory, which found that paraben absorption by men (whether babies or adults) can lead to decreased sperm count. This hard to pronounce class of substances is found in just about everything, even you. A study done by the US Centers for Disease Control found a trace of it in every single person they analyzed. This is problematic because phthalates – which are used in cosmetics and also in many plastic objects – have been found to act as a hormone disruptor linked to reproductive defects, insulin resistance and developmental problems in children. On March 27, 2012, Congress held the first hearing on cosmetics safety in more than 30 years. The hearing came about after a number of businesses and environmental groups urged the Energy and Commerce Committee to change regulations and phase out ingredients linked to hormone disruption and other health concerns—ingredients like phthalates. Here’s the tricky part: phthalates usually aren’t listed on the label of your favorite products, so you have to do a bit of sleuthing to determine their presence. Want a hint? They’re often found in anything that misleadingly lists “fragrance” as an ingredient. Stick to products that are scented with essential oils instead. If you see any of the following on the ingredient list that indicates the product has phthalates—avoid it! Over the last decade, the popularity of pimple-zapping products has skyrocketed. benzoyl peroxide is responsible for this, but you should be wary about using it. That’s because it’s been linked with the promotion of tumor growth. Horrifying, don’t you think? Beyond that, it produces toxic effects in the body simply through inhalation, and is a known skin, eye and respiratory irritant. As if that isn’t bad enough, it’s extremely toxic if you swallow it. Awful! Technically a pesticide – at least according to the Environmental Protection Agency – triclosan is a popular ingredient in just about any product claiming antibacterial properties. It works very well at killing bacteria, and that’s actually the problem: not all bacteria are bad for you, and furthermore, some experts speculate widespread of this chemical could give rise to “superbugs” – harmful bacteria resistant to antibiotics. That’s not all; triclosan has been shown to work as both a hormone and thyroid disruptor. On top of that, it’s terrible for the environment. So put your inner germaphobe at ease and know that water and natural hand soap will more than handle your daily hand-washing needs. In fact, a United States Food and Drug Administration advisory panel showed that washing hands with “antibacterial” soaps that contained triclosan gave no additional germ fighting or illness prevention benefits over regular soaps. Why is it that resorcinol – a popular ingredient in bleaches – is restricted in federal government buildings, but is used freely in so many hair color products? That probably doesn’t sound right to you, and that’s because it isn’t. Not at all! Resorcinol is a known skin irritant that has been shown in studies to disrupt healthy thyroid function in animals. It’s also a common cause of dye allergy that so many women find themselves bothered by. You don’t want this in your hair, or anywhere for that matter! As a skin lightener that reduces dark blemishes caused by everything from medical reactions to bruising, hydroquinone sounds too good to be true. You guessed it… that’s because it is. Hydroquinone reduces the melanin in your skin to get rid of those unsightly marks, but in doing so, it hurts your skin in many ways. First of all, it’s permanently altering your pigment while also weakening the elastin and collagen in your problem area – the very things that are key to keeping your skin firm and youthful! Some people get unsightly blotches after using hydroquinone, and far more get contact dermatitis or have allergic reactions after regular use. Considering how easily it irritates your skin, it’s a wonder that it’s used at all. Finally, like so many ingredients on this list, there is some suspicion that it’s a carcinogen. The results aren’t worth the harm it causes. Here’s a sneaky one. Petroleum pops up in so many cosmetics products, it’s ridiculous. And in case you’re wondering, yes, it’s the very same substance from which your motor oil is made. As an industry standard, there’s a lot of information out there touting the safety of petroleum by-products, so you might be wondering why you should avoid it. It’s because it contains 1,4-Dioxane, which has been listed by the World Health Organization and the Environmental Protection Agency as a probable carcinogen. Cancer from your moisturizer? No thank you. Just the name alone is intimidating. Thankfully known as MIT for short, methylisothiazolinone is an increasingly common antibacterial preservative in everything from baby shampoo to moisturizer. Unfortunately, studies have shown that it contains neurotoxic properties that should be of great concern to all consumers. In studies with rats, a mere 10 minutes of exposure to MIT was enough to cause brain cell damage. Further studies concluded that low concentrations of MIT during neural development increased the risk of seizures and visual abnormalities. Furthermore, the Environmental Working Group has classified it as a skin sensitizer and irritant. The argument often made by skin care companies is that MIT is used in very small concentrations, usually in products that are meant to be rinsed off, thus reducing your exposure to the chemical. Considering the seriousness of its side effects, it’s probably best that you limit your exposure to it completely, wouldn’t you agree? Oxybenzone is an active ingredient in quite a few of the sunscreen products on the shelves of your favorite store. Unfortunately, this chemical has been linked to skin irritation and allergies, hormone disruption and low birth weights in baby girls. What’s scary is that a study conducted by the U.S. Centers for Disease Control found that oxybenzone is present in the urine of 97% of Americans. How much of it have we been exposed to, and how is it affecting us in ways that we don’t quite understand yet? With figures like these, chances are it’s already in your system, so you want to limit your future exposure to it as much as possible. We love colors in our world. They make us feel happier, somehow, and marketers know it. They make their personal care products all shades of blue, green, red, pink, orange and purple so when we open the jar or squeeze the cream or gel out of the tube we’ll be enamored with the experience and come back for more. Whether you’re donning a shocking hot pink lipstick, a classic rouge to make those cheekbones pop, or rebellious black nail polish, if your favorite cosmetics are conventional, chances are they are just as dangerous as they are fabulous. Many of the products you have are likely made with synthetic colors that are made from coal tar. Though pretty, these harsh artificial colors have been shown in studies to be carcinogenic and are likely to cause skin sensitivity and irritation due to the heavy metals they deposit on your skin when you use them. You don’t want that, so if you have any products that were made with synthetic colors, toss them in the bin don’t buy any more! Thankfully, it’s pretty simple to determine if that color in your favorite lipstick is real or not: just check the ingredients, and if you see anything listed beginning with FD&C or D&C, you know it isn’t what you really want. So the next time one of those perfumed lab-coats at the mall pulls you aside to offer you a sample of Company X’s new Luxuriously Lovely Lip Enhancer, tell her thanks but no thanks, and proceed either online or to your nearest organic grocery for superior alternatives. You’ll be amazed at how much is out there. Rachel, Courtney, Hope and Abby are about to put 46 TOXIC chemicals on their skin. Annmarie Gianni Skin Care was founded to provide a clean, natural skin care experience using natural, organic and wildcrafted ingredients. Our $10 skin care sample kit is designed to be a complete skin care routine for your skin type (anti-aging/dry, normal/combination, or oily/acne prone), so you can see how your skin looks and feels after using it for a couple days, then decide if you want to buy full sizes. The best part is that we take care of the shipping cost anywhere in the world on these sample kits and send you a coupon for $10 off any of their full-sized products, which makes your sample kit essentially free. I LOVE benzoyl peroxide I use it for EVERYTHING including my teeth!! Now i’m horrified. How can I go from fighting stains, washing my face, brushing my teeth to never buying it again??? I need an alternative… HELP!!! I don’t believe everything EWG says and you shouldn’t either. Studies are all over the place and while we should proceed with caution, there is is plenty of sensationalizing going on with product ingredients these days. In the end, someone is making money off something and it’s always going to skew (even if it’s unethical) the “study.” And some of the studies I read for ingredients aren’t even sold in the concentrations they propose, so it has just become a a huge amount of speculation. So many things in high doses can pose a risk – even water! So should we say that water is bad for you since drinking too much can kill you? Hi Rose, I wonder about this same thing when it comes to all resources really. It’s hard to find good sources of information on this topic of toxins. Was diagnosed Hypothyroid in 2013. Alternate days -50mg and 75mg Levothyroxine. Was doing fine, until I noticed my hair was thinning 3 weeks ago. Who, and where are the knowledgeable doctors to help?? Nobody seems to know anything!! I encourage you to go to a holistic doctor and acupuncturist. They look at alternate methods for helping thyroid issues. Thyroid issues can be affected by so many internal factors and if you are misdiagnosed, you will eventually get full blown thyroid issues (hyper or hypo) since your body will completely rely on meds. Using holistic methods and acupuncture has improved my inflammation and slightly sluggish thyroid without the use of Rx. Hi Karen, The hair clumps clogging my shower drain were so upsetting that I spent over one year researching the causes of hair loss in women. This is one of the most popular articles at Hypothyroid Mom and I have no doubt it’s because many of us with hypothyroidism suffer from hair loss as a symptom. Thank you for all your Articles you post to FB. I have read and learned many things from your page. This was truly enlightening for me because I am an avid wearer of makeup. You made me smile Katrina. Your comment reminds me why I created Hypothyroid Mom. U used the wrong word form.it should be due not die. Thank you for catching that. Much appreciated.